Christus St. Vincent Regional Medical Center has made a significant investment to support the college’s Respiratory Care Program. 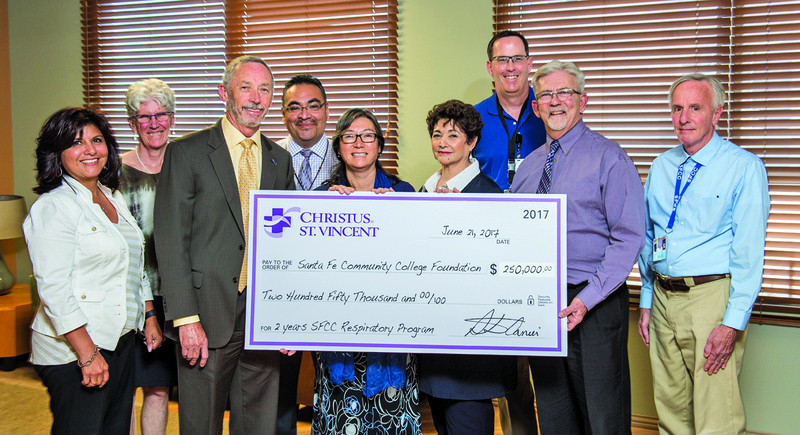 The gift of $250,000 to the SFCC Foundation affirms the college’s and the hospital’s joint commitment to preparing New Mexicans for rewarding health care careers in Santa Fe. The Foundation partners with business and industry leaders whose contributions to scholarships, professional development, internships, resources, materials and more further opportunities for students. Pictured left to right: Lillian Montoya, Rebecca Jeffs, Patrick Carrier, Scotty Silva, Jenny Landen, Deborah Boldt, Ramar Jette, Randy W. Grissom, and Patrick Nichols. The SFCC Foundation has awarded Veterans’ scholarships to Wyetta Bradley and Frances Jessop. The scholarship fund is designed for veterans and their dependents, who are not normally eligible to receive educational benefits. The scholarship was established through a partnership between the Foundation, City of Santa Fe Veterans Advisory Board and U.S. Bank. Jessop, whose father was in the Navy and served in Vietnam, is earning a certificate in Controlled Environment Agriculture and would like to continue her studies to earn an Associate in Applied Science. Wyetta Bradley served in the U.S. Army during Operation Desert Storm and is working on her pre-requisites for the Nursing Program. The SFCC Foundation helped send student contestants to the SkillsUSA Competition in Louisville, Kentucky, earlier this summer. 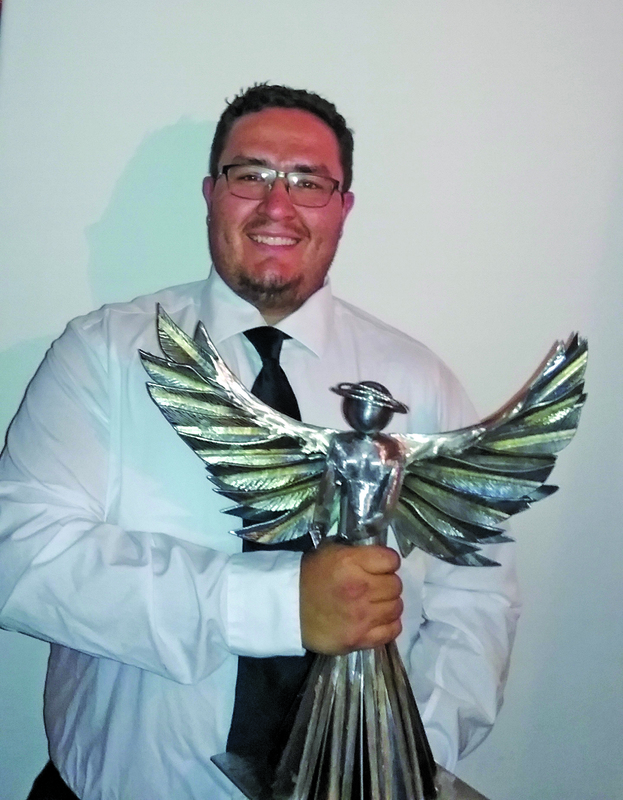 Having both won First Place in the state contest, two SFCC students earned awards at the nationals: Frank Trujillo placed eighth in the Welding Art/Sculpture category and Kyle Pacheco placed eleventh in the Culinary Arts category. “The entire process was an adventure full of learning,” says Trujillo. “It is a great learning experience, and builds a lot of character. I have learned a lot about myself throughout this SkillsUSA journey.” Read more about Trujillo’s story at https://www.sfcc.edu/skills-usa/. Shop smile.amazon.com, select Santa Fe Community College Foundation as your charity, and support SFCC students with your qualifying Amazon purchases. To learn about making an investment to support SFCC students, contact Deborah Boldt, Executive Director of the SFCC Foundation, at 505-428-1704 or deborah.boldt@sfcc.edu. For information on the Foundation, visit sfcc.edu/foundation.